Jerome Corsi has amended his lawsuit against special counsel Robert Mueller to include The Washington Post, its owner Jeff Bezos and one of the paper’s reporters. The right-wing conspiracy theorist claims that he lost a $15,000-per-month severance arrangement with his former employer, InfoWars, after a Post reporter began asking questions related to the Mueller probe. Corsi alleges that the reporter received leaks from Mueller’s office that he is investigating whether Corsi received hush money from InfoWars. Corsi provides no evidence to back up his claims. Conspiracy theorist Jerome Corsi has added The Washington Post, its owner Jeff Bezos and one of the newspaper’s reporters to his lawsuit against the special counsel, claiming without evidence that WaPo received an illegal leak from prosecutors working on the Russia probe that ultimately caused him to lose a severance deal with InfoWars, his former employer. Corsi alleges that WaPo reporter Manuel Roig-Franzia contacted him last Thursday to inquire about a $15,000-a-month severance arrangement he had with InfoWars, which is owned by Alex Jones. Corsi claims that Roig-Franzia suggested that the special counsel has been asking witnesses whether the severance deal was actually a hush money arrangement intended to keep Corsi quiet regarding Jones, InfoWars and Roger Stone, an InfoWars contributor who is in the special counsel’s crosshairs. After that inquiry, Corsi says that Jones’ father, David Jones, contacted him to end their severance deal, which had been in place since Corsi was fired from InfoWars in June 2018. Corsi initially sued special counsel Robert Mueller, the FBI, the Justice Department, the CIA and the National Security Agency on Dec. 9, alleging that the government violated his Fourth Amendment due process rights while illegally leaking secret grand jury information. The first lawsuit sought $350 million from the government. The amended complaint appears to be an attempt to capitalize on Bezos’ status as wealthiest man in the world. Corsi is seeking $1.6 billion in damages in the new complaint. Corsi, 72, has been involved in the special counsel’s investigation since late August 2018, when he was subpoenaed to meet with prosecutors working for Mueller. Prosecutors appear to be trying to figure out whether Corsi had contact with WikiLeaks during the 2016 campaign and was told about the group’s plans to release emails stolen from Clinton campaign chairman John Podesta. WikiLeaks began releasing those documents on Oct. 7, 2016. Prosecutors also want to find out whether Corsi passed information to Trump associates, including Stone, a longtime confidant of Donald Trump. Stone has vehemently denied that Corsi told him anything about WikiLeaks’ plans to release Podesta documents. Corsi has appeared twice before Mueller’s grand jury, and prosecutors offered him a plea deal on Nov. 14 if he would plead guilty to lying about email exchanges he had with Stone. Corsi, who is best known for spearheading the anti-Obama “birther” movement, has since mounted an aggressive media and legal campaign to push back against Mueller & Co.
“These hush money payments to Plaintiff Corsi were maliciously and falsely represented to be made by Dr. David Jones, father of Alex Jones of InfoWars,” Corsi writes in the lawsuit. Corsi claims that Roig-Franzia also told him that he had learned that Corsi was still being paid $15,000 per month by Infowars, even though he left the company in June 2018. Corsi also identified this Daily Caller News Foundation reporter as a “material witness” in his lawsuit, claiming that the reporter received leaks of information from Mueller’s office. TheDCNF reported on Dec. 13 that Corsi was involved in a cancer fundraiser where there are no public records indicating that the doctor involved actually exists. In response to the article, Corsi alleged that TheDCNF informed him that the information was received from the special counsel. Both of Corsi’s allegations are false. Roig-Franzia did not respond to a request for comment about Corsi’s allegations that the reporter received a leak from the Mueller office, which is known for its limited interactions with reporters. InfoWars’ lawyer also did not respond to a request for comment. Corsi’s claims about the hush money allegations provide new context to a series of events that have unfolded at InfoWars in recent days. On Friday, the site published an article asserting that reporters with The Washington Post and ABC News were inquiring about possible hush money payments from Jones and his father, a financial officer with the company. 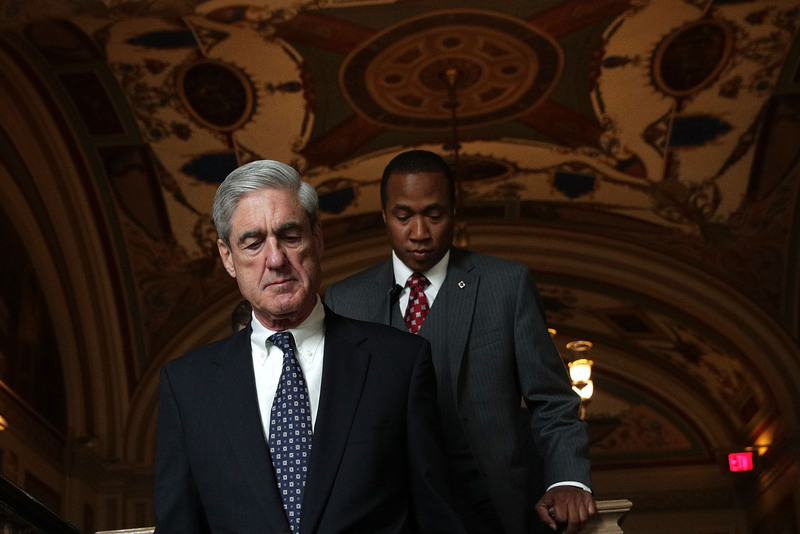 “Mueller seems to be exploring that the job was hush money in some way,” Helderman wrote in the email, which has been reviewed by TheDCNF. WaPo has not published a report about any alleged hush money payments involving Corsi, InfoWars or Stone. Corsi appears to be denying the allegations of hush payments, as do Stone and Jones. “The claim that any of my recommendations were arrangements for ‘hush money’ is both ridiculous and false,” Stone told TheDCNF. “The idea that Alex Jones and his father, Dr. David Jones, would be engaged in such a scheme is completely ludicrous,” the InfoWars article states. Jones denied the hush money allegations on his radio show on Friday and said that Corsi was fired in June 2018 over his poor work product. 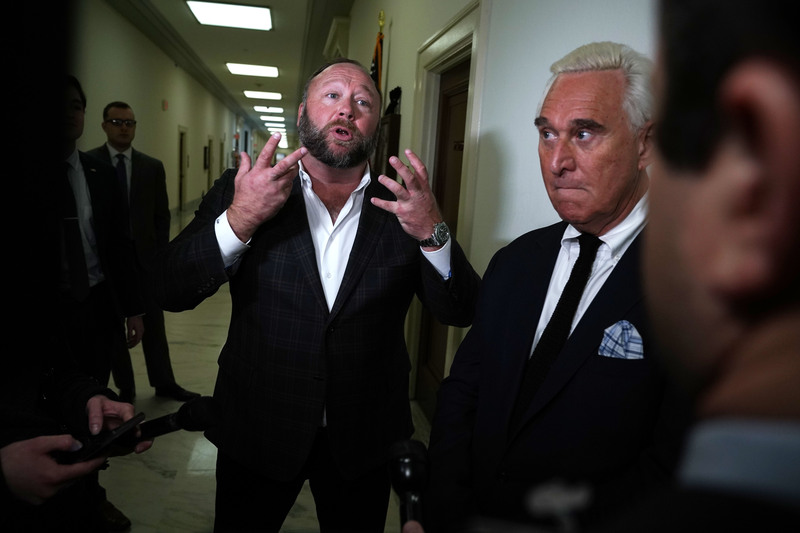 But with his trademark dramatic flair, Jones also claimed that he, his father and Stone were close to being indicted by federal authorities. He also said that he has heard from unidentified Mueller grand jury witnesses that questions have been asked about his father, who runs the business side of InfoWars. “If you think threatening to set my dad up makes me want to back down, it’s the opposite,” Jones said on his show. Jones also addressed InfoWars’ financial arrangement with Corsi. The dispute also highlights a rift between Stone and Corsi that has grown since Corsi began publicly discussing his interactions with the special counsel. Corsi claims he has provided testimony to Mueller’s grand jury that, if accurate, would undercut Stone’s long-standing denials about what he knew of WikiLeaks’ plans to release documents related to the 2016 election. Stone posted tweets during the 2016 campaign that suggested he had some insight into WikiLeaks’ plans to release anti-Clinton materials. But he has said he did not know the content or source of any WikiLeaks materials until they were released. Stone has claimed he received vague tips from Randy Credico, a left-wing comedian who is close friends with a WikiLeaks lawyer. Text messages released by Stone appear to back up that claim. “Julian Assange has kryptonite on Hillary,” Credico texted Stone on Aug. 27, 2016. “Hillary’s campaign dies this week,” he wrote on Oct. 1, 2016, six days before WikiLeaks began releasing Podesta’s hacked emails. Corsi has thrown a wrench into Stone’s story by claiming that he told Stone in August 2016 that WikiLeaks would release Podesta’s emails. Stone has claimed that his tweet was based on information he had received from Corsi and other sources about John Podesta and his lobbyist brother’s business activities. Corsi also writes in his book that he told Mueller’s grand jury that Stone asked him to contact WikiLeaks following the damning publication of an “Access Hollywood” tape on Oct. 7, 2016, showing Trump speaking crudely about women. Corsi claims that Stone wanted him to contact WikiLeaks to ask the group to start releasing Podesta’s emails. Stone also called that claim “absurd.” He says that he knew that Corsi did not have a link to WikiLeaks and would not have asked him to contact the group. He has also noted that if he wanted to reach WikiLeaks he would have gone through Credico, who he knew to have a relationship with WikiLeaks’ lawyer. Corsi claims that he had no contact with WikiLeaks or Assange. He’s also insists that he figured out on his own accord that WikiLeaks had Podesta’s emails. Corsi released a draft of a plea offer from Mueller’s office on Nov. 14. The proposal sought a guilty plea from Corsi for lying to prosecutors about his emails with Stone regarding WikiLeaks. “Word is friend in embassy plans 2 more dumps,” Corsi wrote in an Aug. 2, 2016, email to Stone, seemingly referencing Assange, who lives under asylum in the Ecuadorean embassy in London. Stone has acknowledged receiving the email but asserts that the document does not show Corsi stating that WikiLeaks had Podesta’s emails or planned to release them.